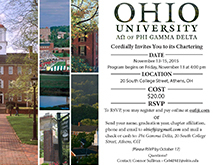 Phi Gamma Delta is launching a quarterly communications newsletter to keep chapters up-to-date on upcoming events, campaigns and services from IHQ. The newsletters will also include content for correspondence to graduates and your campus community. Would you like to see your chapter's news featured on the Fraternity's website, magazine or social media accounts? Submit News. 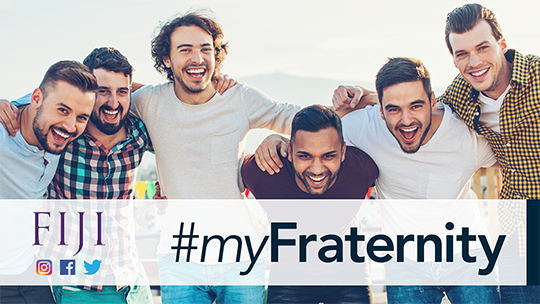 The #myFraternity campaign is coming up on September 12. Please encourage your members to post on that day about their positive fraternity experience. In the mean time, there is a Phi Gamma Delta #myFraternity Facebook frame members can add to their profile pictures leading up to that day. To add the frame, simply click to update your profile picture, select 'Add a Frame' and search for "myFraternity - Phi Gamma Delta." Select the frame and keep it through September 12. The beginning of fall semester is the perfect time to start planning your graduate mailings for the year. We offer Discount Packages if you plan on sending out multiple mailings and Pig Dinner save the dates, invitations and programs. To receive a quote for your mailing, please fill out the Mailing Request Form. Phi Gamma Delta has created a Communications Facebook Group to provide resources to undergraduate chapters and to serve as a communication link between chapters and IHQ. Please contact the Coordinator of Communications Paige Prylinski with any questions you may have.